Are there crocodiles? Can I go swimming? You are in crocodile country. Estuarine crocodiles inhabit the Hinchinbrook area. Crocodiles are dangerous and attacks can be fatal. Never take unnecessary risks in crocodile habitat. You are responsible for your own safety. Queensland Government guidelines on being CrocWise can be found here. Do I need a fishing licence or permit? 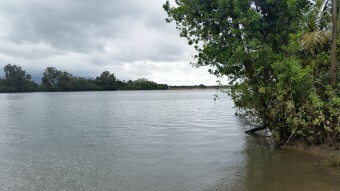 Anglers do not require a licence to fish recreationally in Queensland. Size and bag limits do apply. There are also seasonal closures for some fish species like barramundi. A guide to Queensland’s fishing regulations can be found at the Department of Agriculture, Fisheries and Forestry website here. Before heading out on the water make sure you are aware of transit lanes and fishing zones in the marine park. Visit the Great Barrier Reef Marine Park Authority website www.gbrmpa.gov.au. How do I get to Hinchinbrook Views? Hinchinbrook Views is located in Macknade, 10 minutes drive from Ingham. The regional centre of Townsville is a 75 minute drive along the Bruce Highway. The nearest airports are Townsville or Cairns. Greyhound buses operate regular services. What happens if I don’t have a boat? There are a number of boat hire and fishing charter operators in the area. Is there anything else to see and do in the area? The Hinchinbrook Shire is surrounded by world class natural beauty. Scenic drives, walks and hikes are a must. No visit to the region would be complete without seeing Wallaman Falls, Australia’s highest sheer drop waterfall and Hinchinbrook Island, the world’s largest Island National Park. Tyto Wetlands, a rehabilitated wetland site, home to over 230 bird species is also a must see. Don’t miss Lucinda Jetty – the longest sugar loading jetty in the world. It is used to load raw sugar out to the ships via conveyor and then the sugar is transported to all parts of the world. The annual Australian Italian Festival is a must and highlights the Ingham’s unique Italian heritage. If you cancel your booking within seven days of your check-in date, Hinchinbrook Views will refund 100% of your payment. No refund will be given if less than 7 days notice is given of your cancellation.